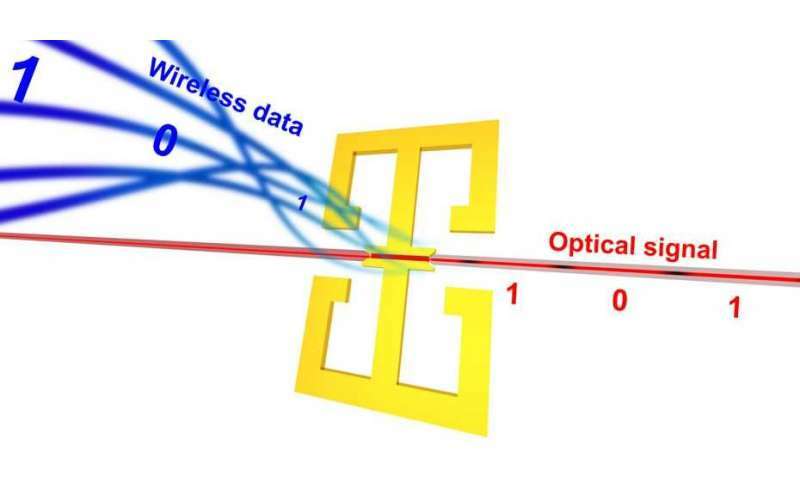 Reseachers at ETH Zurich have developed a modulator with which data transmitted via millimetre waves can be directly converted into light pulses for optical fibres. 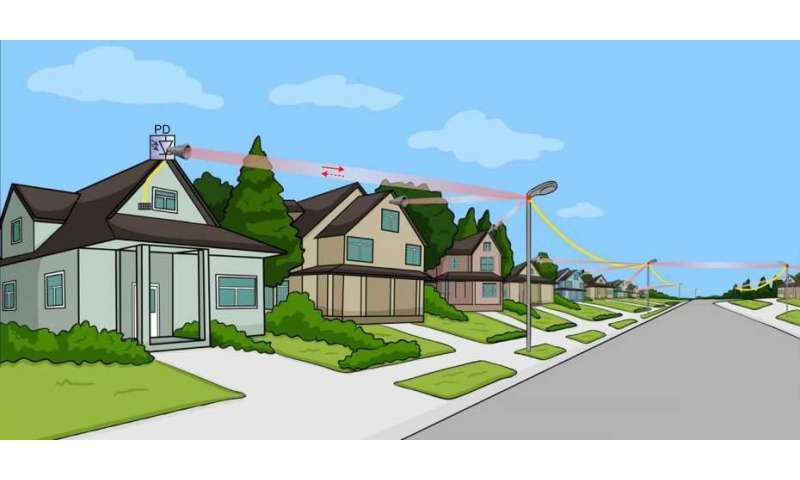 This could make covering the "last mile" up to the internet socket at home considerably faster and cheaper. The high oscillation frequencies of light waves make them ideally suited to fast data transmission. They can be sent through optical fibres and easily carry hundreds of billions of bits (Gigabits) per second. The "last mile" from a central fibre optic cable to the internet socket at home, however, is the most difficult and expensive. Some alternatives, for instance 4/5G mobile telephony, are cheaper, but they cannot provide all users simultaneously with the extremely high transmission rates required by today's data-hungry applications such as streaming TV. Jürg Leuthold, professor at the Institute for Electromagnetic Fields at ETH Zurich, and his collaborators have now, with support by colleagues at the University of Washington in Seattle, developed a novel light modulator that will make it possible in the future to cover the last mile efficiently and at a low cost with high-frequency microwaves – so called millimetre waves—and hence high data transmission rates. Leuthold and his colleagues have now succeeded in building a light modulator that works entirely without batteries and electronics. "That makes our modulator completely independent of external power supplies and, on top of that, extremely small so that it can, in principle, be mounted on any lamppost. From there, it can then receive data via microwave signals from individual houses and feed them directly into the central optical fibre", explains Yannick Salamin, a Ph.D. student who made crucial contributions to the development of the new modulator. The electrically sensitive ("nonlinear") material inside the slit ensures that even the tiniest electric field created by the antenna will strongly influence the propagation of the plasmons. That influence on the oscillatory phase of the waves is conserved when the plasmons are converted back into light waves at the end of the slit. In this way, the data bits contained in the millimetre waves are transferred directly onto the light waves – without taking a detour through electronics, and without any external power. In a laboratory experiment with microwave signals at 60 Gigahertz, the researchers were able to demonstrate data transmission rates of up to 10 Gigabits per second over a distance of five metres, and 20 Gigabits per second over one metre. Besides the tiny size and the negligible energy consumption, the new modulator has a number of further advantages. "The direct transfer from millimetre waves to light waves makes our modulator particularly versatile regarding the frequency and exact format of data encoding", Leuthold emphasizes. In fact, the modulator is already compatible both with the new 5G technology and with future industry standards based on millimetre-wave and terahertz frequencies of 300 Gigahertz and data transmission rates of up to 100 Gigabits per second. Moreover, it can be produced using conventional silicon technology, and thus at a comparatively low cost. Finally, Leuthold can reassure users who might be worried about the electromagnetic radiation involved. Differently from the radio waves or microwaves of a WiFi modem, which propagate evenly in all directions, millimetre waves can be strongly focused for transmission to the outside and only propagate between the roof antenna and a light pole inside a beam that is twenty centimetres in diameter. This strongly reduces the power needed for transmission compared to other wireless technologies. It also eliminates the typical problems of WiFi modems, whose signals can get in each other's way. Interesting as proof of concept and hopefully commercially viable but one somewhat important "detail" was left out: multiplexing - if possible, where and how? TDM would not seem possible for such a passive device. Are the antennas tunable for WDM? Does it require a single channel from the antenna to the splitter?